← How diverse is the online conversation about the European elections? Following on from my previous post, here are the latest trends in the online debate about the forthcoming European elections (based on statistics collected during the last week). There have been more than 200,000 mentions of the European elections during the last seven days (social media, news sites, blogs, forums …). This represents a 50% increase on the previous week. Spain continues to have by far the most active online debate about the European elections, accounting for 32% of all mentions of keywords relating to the elections. 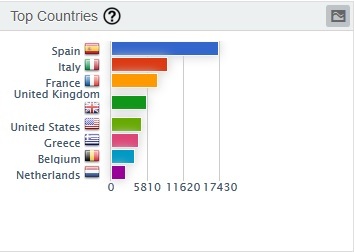 Italy has risen to second place, with 17% of mentions. France has made a big leap from 7th to 3rd place (perhaps linked to political debates during local elections). The UK finds itself in 4th place (driven partly by the TV debate on EU membership between Nigel Farage and Nick Clegg on 2 April). 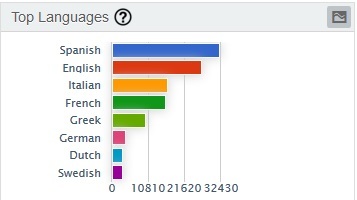 Spanish has now overtaken English as the most frequently used language in mentions of the European elections online (29% of all mentions). On Twitter, use of the #EP2014 hashtag is becoming increasingly widespread. #EP2014 was used in 33% of tweets about the elections during the last week (compared to 31% the previous week). The charts in this post were produced using Engagor.